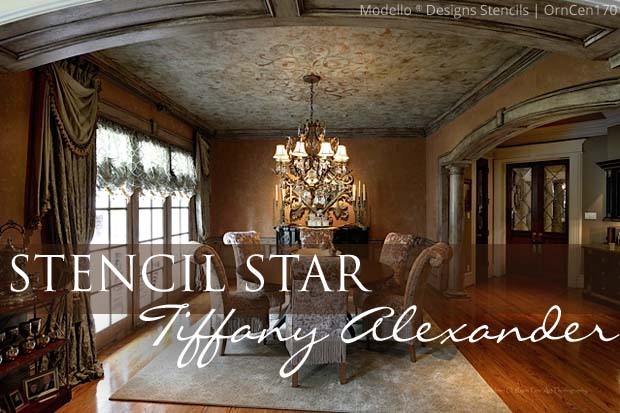 Our Stencil Star™ series showcases the use of our Royal Design Studio mylar wall stencils and Modello™ custom vinyl stencils on walls, ceilings, floors, and more by creative customers. 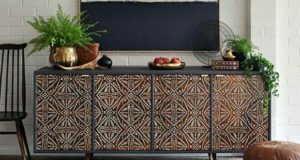 This month, we follow the incredibly creative and gorgeous work of the talented Tiffany Alexander as she combines her flair for mixing stencil patterns with innovative decorative finishes. Tiffany’s faux painting work is unmatched. She is a true artist and it was a pleasure to photograph rooms so beautiful and full of detail and texture”. Using the White on White Embroidery How-to from the Modello Master Methods Tutorials, Tiffany stenciled the Acanthus Trellis Wall Stencil with a Metallic Color Foil and metallic plaster. Lovely! 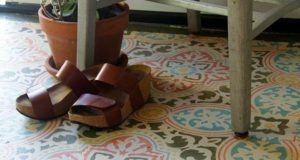 We caught up with this talented artist to learn more about her work and her love for stenciling. Let’s take a look at what she had to say! Tiffany: My favorite thing to stencil by far is furniture. I like making built-ins and kitchens, personal and custom. I want my clients to have something unique and special. I love doing ceilings, too. I think it’s hard to match the impact of an awesome ceiling, but they are best done with Modellos! 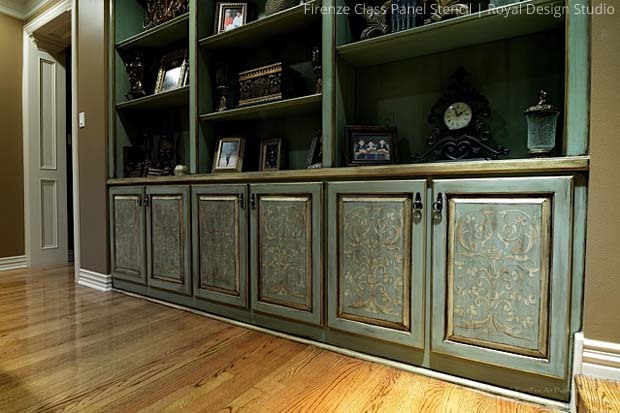 The Firenze Class Panel Stencil, crackles and heavy color glazing make this stenciled cabinet a standout. Gilded Beauty! 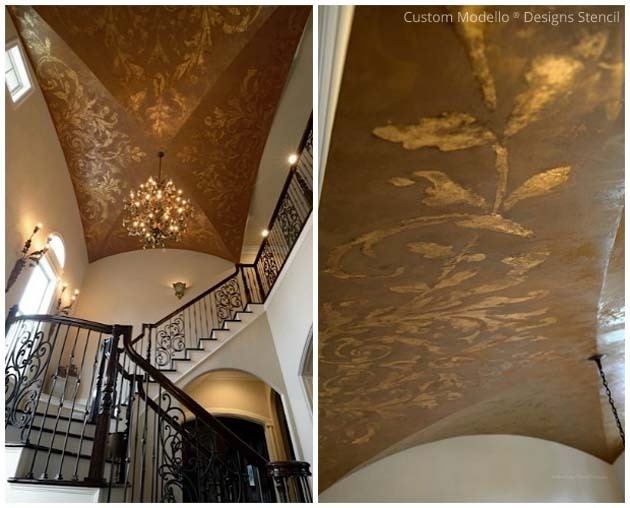 A custom Modello® Designs vinyl stencil was gold leafed onto a brown suede plaster base on a large groin ceiling. 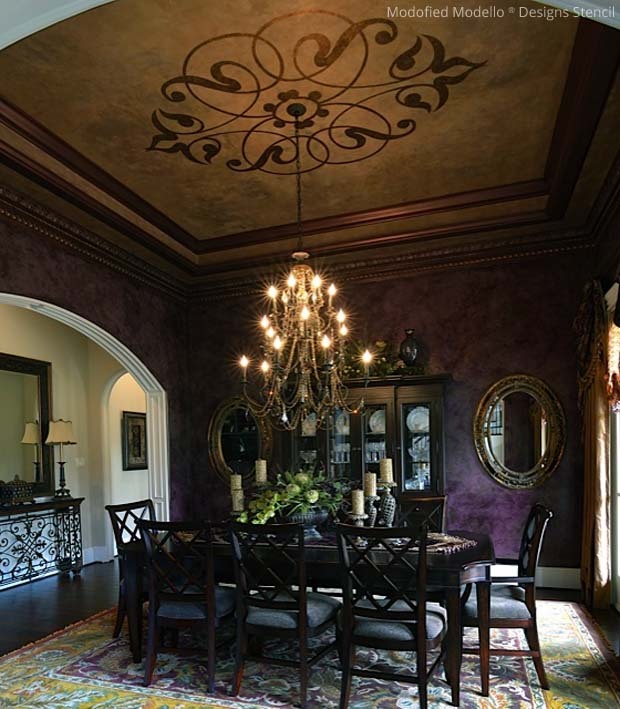 A custom Modello® Designs medallion stencil was used on the dining room ceiling with the Pietre Dure Finish from the Master Methods Tutorials. 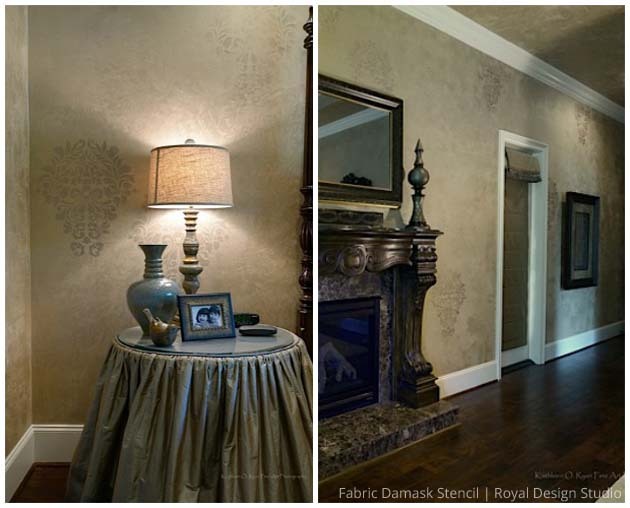 An eggplant Venetian Plaster on the walls makes a wonderful complement. Tiffany: I almost always combine multiple stencils, either by layering or taping of certain elements of one pattern and replacing them with parts of another stencil. 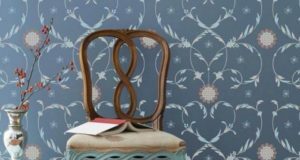 I particularly like using parts of Royal Design Studio’s French Floral Damask stencil and the Antoinette Damask stencil. I also love the color shaper tool – it’s amazing and I use it all the time when I stencil. Striking! 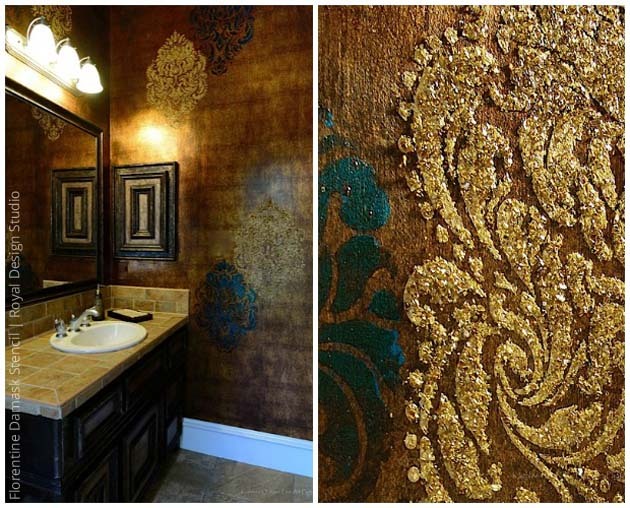 The Florentine Damask Stencil is alternately applied on a square metallic base with raised plaster and crushed glass beads and a metallic color foil. 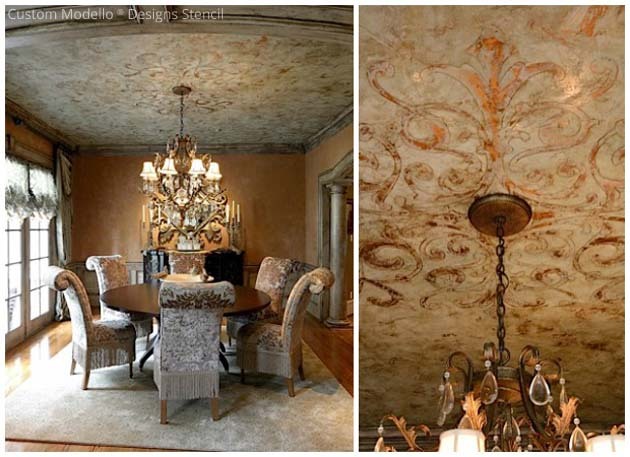 A rustic luxe dining room ceiling features a custom Modello Designs® Medallion Stencil embedded within Venetian Plaster. Tiffany also enjoys using stencils in a non-traditional manner. 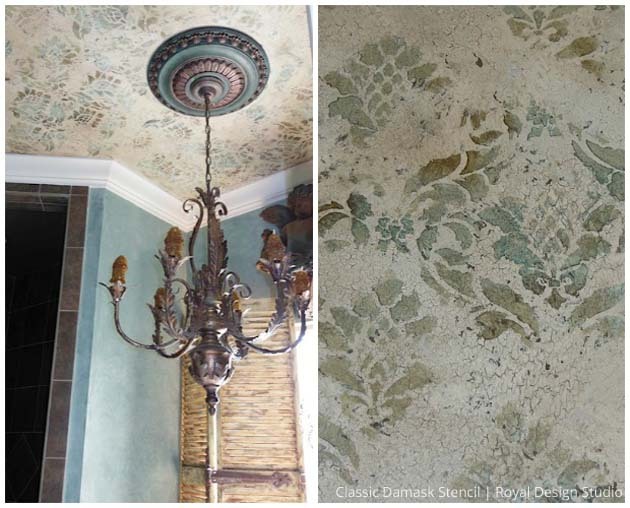 On a surface of crackled plaster, she stenciled the Classic Damask Stencil as a ‘torn paper’ stencil finish on the ceiling, breaking up the pattern in a pleasing way. Tiffany: I am drawn to stenciling because of the versatility and visual depth a stencil always adds to projects. I love that the same stencil can be used in both modern and traditional settings. 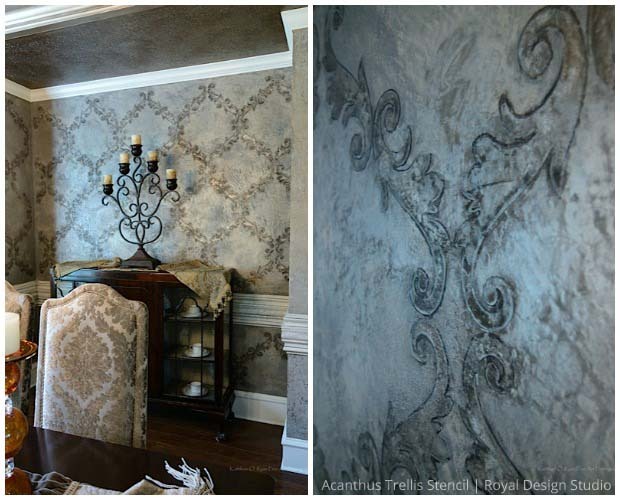 The Large Fabric Damask Stencil rests elegantly against a metallic plaster base. 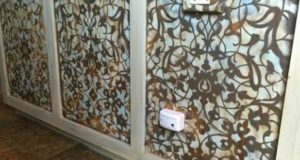 Stencils ARE versatile – the chameleons of the design world! We hope you’ve enjoyed seeing the beautiful stenciled finishes by Tiffany Alexander. Please be sure to stop by Blank Canvas Design Studio to see more images and request information about her incredibly diverse finishes and projects. If you’re working on a few Royal Design Studio stencil projects yourself, let us know – you might find yourself featured as a Stencil Star! Beautiful post Regina and Tiffany, you rock! Omg! Having lived in Italy for four years I can truly say Tiffany’s work rivals anything I have ever seen! In Italy, Russia, France, ANYWHERE! What an amazing, talented and gifted artist she is. Can hardly wait to see what she will create next! Oh my, the beautiful texture with the crushed glass made my heart skip a beat! Very good written information. It will be valuable to anybody who employessit, as well as yours truly :). Keep up the good work – for sure i will check out more posts.